I found on internet some informations about export to excel. When I test it, I will describe my work. I'm from Russia, city of Yekaterinburg (1000 miles to East from Moscow, near snowly Siberia). Just now I'm writing a program (Harbour+MiniGUI) - export a report from DBFs (DOS charset) to Excel. I had some expirience with DBF->Excel process (I'm not expert yet, but can help someone if you need). oSheet:Cells(i,1):Value := PEOPLE->Surname    // "Ivanow"
oSheet:Cells(i,2):Value := PEOPLE->Name        // "Ivan"
oSheet:Cells(i,3):Value := PEOPLE->B_DATE     // "23.12.1967"
P.S. Can anybody help me to translate Jose Miguel's MiTPINT's description (in HTML-file) and comments in PRG-files from Spain (I don't know it) to English? I downloaded it, it's good thing (I amazed with PDFprint! and others - good of course; print to OpenCalc - it's really what our programming group need [we plans move from MS Office to OpenOffice next year]) - and I want to use it (but don't understand all). Hearty welcome to the forum. Your programming concept and logic is fantastic Alex Gustow. I need to write format of cells. I can do it cell by cell, but how to do it using clipboard? On some computers it works great - worksheet "Aktivitäten" is beeng selected. 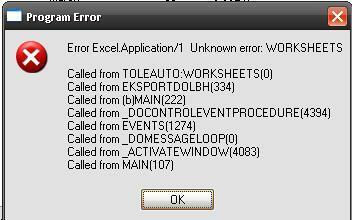 When I run task manager, I can see that "EXCEL.EXE" process has started. It's problem with selecting sheet. but the same error has occured. and I can't find reason for this error. Did you meet such a situation? If you don't know something, and I know it (because I read other Internet pages and other forums and asked some days ago - like everyone of us - many "foolish questions" to other people who knows it... and now I think [but not sure] that I know about it a liiiiittle greater than you) - why I can't answer to you when you're asking: "hey! anybody knows how I can..."? I'm really newby in many programming things - and in Harbour+MiniGUI and DBF->Excel tasks too... But I like (as everyone "really means himself a programmer" must to like - I think) to learn new and new and new... every day. ...and that's all folks ("one move" - remember?)! ...and someone told about my "fantastic logic"?.. Primary-school mistake! About your 1st problem - my answer helps you? Thank you, an excellent contribution.